The Hotline Slot is a five reels slot with three rows and 30 pay-lines. The theme of these Netent slot are the 80s and especially the TV series Miami Vice. You can play the Hotline Slot like all Netent Slots on all platforms including Smart Phones and Tablets. From 15p you can spin the reels up to a maximum bet of £450. The game has some interesting feature, especially a bonus bet feature. If you activate this, expanding wilds land on your reels, which triggers great winnings. But there is also a Free Spins feature and the expanding wilds play a role here as well. 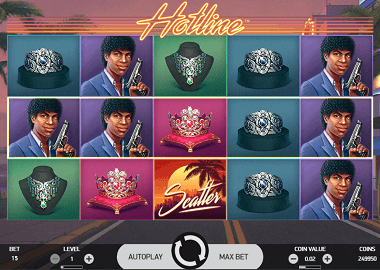 Symbols and Payouts: The symbols of the hotline slots are in the style of the 80s. The sound was also perfectly chosen – these synthesizer sounds are incomparable. The main characters are the two cops that were played in the TV series by Don Johnson and Philip Michael Thomas. Besides these two symbols, the Lady is the most valuable symbol and pays you up to 200x your bet. These symbols are complemented by three low paying symbols (a bangle, a décolleté and a crown). The wild symbol is the red or white Ferrari and Scatter is the sunset symbol. Hotline Bonus Bet: The Hotline Bonus Bet is an extra bet, which you can activate for each row individually. The bonus bet doubles your bet per row. So if you play all three rows with bonus bet, you have to play the triple bet. But it’s worth it, because first of all the Hotline Slot is much more exciting and secondly expanding Wild symbols land on your reels. And these trigger re-spins with multiple wins on multiple pay-lines simultaneously. Free Spins feature: The highlight of the Hotline slot is the free spins feature. You trigger the feature when you land 3 sunset scatter symbols on your reels 1, 3 and 5. During the free spins, expanding wilds also land on their reels. In contrast to the base game, the wilds will remain on your reels until the end of the feature. You only get seven free spins, but if you get a wild symbol every now and then, you can fill all reels with wild symbols. This then triggers a top win of 400x your line bet. The Hotline Slot is a great Net Entertainment slot with a very nice theme. Especially for players who experienced the 80s, this slot is a must. You can play the Hotline Online Slot here for free. Click for that on the hotline banner above. You can also play more Netent online slots here. If you want to play for real money, we recommend the Rizk Casino and Guts Casino. There you get a bonus and free spins when you register. In addition, both casinos pay out your winnings very quickly!